Mad About Meghan: Meghan Plans "Affectionate" Royal Wedding Speech & An Important Royal Role in April! Meghan Plans "Affectionate" Royal Wedding Speech & An Important Royal Role in April! Hello, we're back to share two very interesting stories from the weekend's papers! 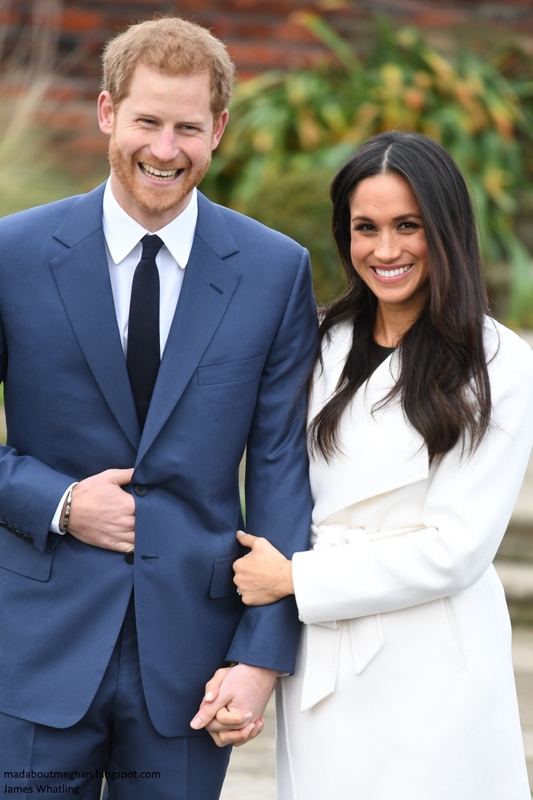 Harry and Meghan have been busily planning the royal wedding this month, from the guest list to the dress designer and numerous little touches which will ensure that while it's a Royal wedding, the day will be very much theirs. The Sunday Times' inimitable reporter Roya Nikkhah shared an exclusive detail about the speeches on the big day: Meghan intends to give one of her own. Meghan is said to be planning an "affectionate" tribute to her husband-to-be and will use the opportunity to thank Her Majesty, family and friends for their support. 'After the best man, will it be the best woman? Meghan Markle is planning to deliver a speech of her own at her wedding to Prince Harry this spring. In a striking departure from royal marital tradition, the American former actress is understood to be ready to speak at the reception that will follow the wedding ceremony on May 19. We know Harry and Meghan intend to continue their pre-wedding tour around the UK meeting locals and visiting organisations and charities. It looks like Meghan has also been enlisted for one of the most important events on the royal calendar this year, the Commonwealth Heads of Government Meeting in April. Camilla Tominey reports: "Meghan Markle will face her toughest royal test yet when the Queen hosts the biggest gathering of heads of state ever to be held in the UK during a Commonwealth summit - and Meghan and Prince Harry are poised to take on roles usually reserved for Prince William and Kate." 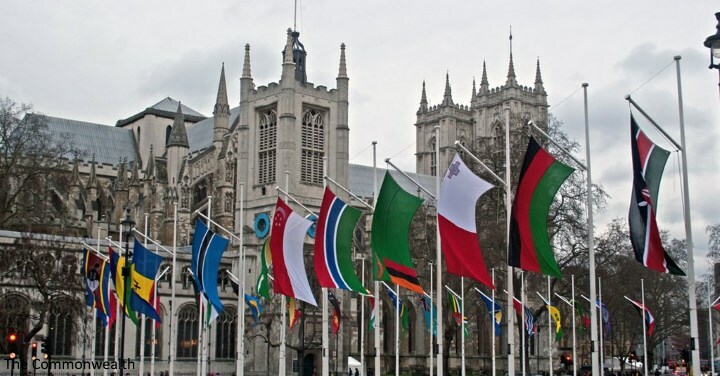 The Commonwealth Heads of Government Meeting (CHOGM) is being held in London in April with an array of forums and events from the 16th - 20th. Leaders from all member countries are expected to gather in London and Windsor. They will come together to reaffirm common values, address the shared global challenges faced and agree how to work to create a better future for all Commonwealth citizens, particularly young people. Politically, the event has added significance because of Brexit and the government will be eager to deploy the Royal family throughout the week. Prime Minister Theresa May said: "In hosting CHOGM, the UK is committed to working with all members, not only to reaffirm these shared values, but also to re-energise and revitalise the Commonwealth to cement its relevance to this and future generations. As we look to create a truly global Britain, the deep partnerships that we share through a 21st century Commonwealth can help us strengthen the prosperity and security of our own citizens, and those of our many friends and allies across the world." 'The Royal Family will be central to the week-long event, with the Queen, Prince Charles, Camilla and younger royals including the Duke and Duchess of Cambridge and Prince Harry all expected to take part. 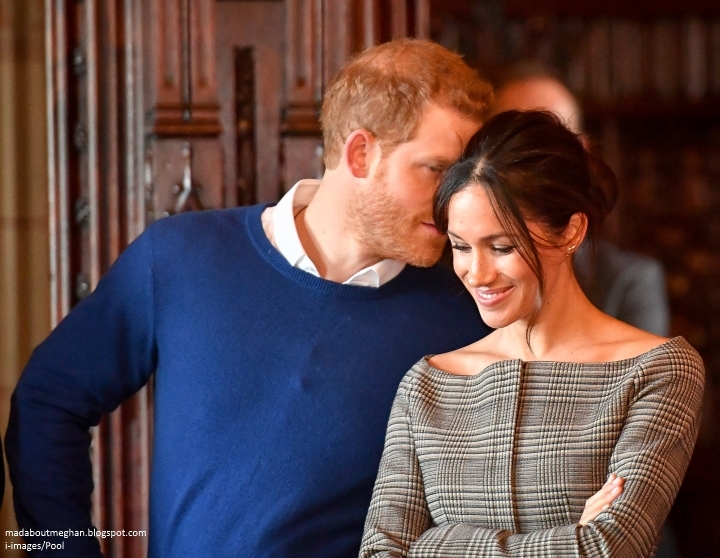 Meghan, 36, expressed a desire to find out more about the Commonwealth during an interview with Harry following their engagement last November. Ms Tominey believes there is a possibility Meghan could be present at the glittering State banquet at Buckingham Palace. 'It is thought she will accompany Harry, 33, on a number of appointments - with speculation the couple may even need to step in for William and Kate because their third baby is due around the time of the conference, which starts on April 16. If Meghan and Harry attend, I wouldn't necessarily expect she'll wear a tiara. As noted by reader Eve, In June 1981, Lady Diana Spencer attended the Saudi State banquet at Claridge's during her engagement to Prince Charles. Diana wore beautiful jewellery from Collingwood. Although, she could have worn her family's Spencer tiara, she elected not to. Eve also noted Diana attended the Nigerian State Banquet in 1981 before her wedding. Again, sans tiara. The article also reports Harry and Meghan will attend the Commonwealth Day Service, as a prelude to CHOGM, on 12 March at Westminster Abbey. I found this story incredibly interesting and unexpected; it's highly unusual for a royal fiancée to play a role in an event of this magnitude. World leaders and global media will descend upon London and Windsor throughout the week with a firm focus on Brexit. At its core, it's going to be a week filled with discussion surrounding the Commonwealth and shared challenges member countries are facing. There are going to be various forums with discussions on young people and women. I could see Harry and Meghan attending those. As for the State banquet, I would be surprised if the couple attend pre-wedding, however, I wouldn't entirely rule it out either. Meghan has clearly impressed the Queen and royal aides who obviously wish to deploy her and Harry. I imagine she has privately expressed a strong interest too. It's the perfect opportunity for the future Duchess to learn about the Commonwealth, ahead of her first tours, which are set to include Australia later this year. This is actually brilliant. Meghan being thrown into the deep in sort of speak has been interesting to watch but with her background it makes a lot of sense. She, of all the royal spouses, seemed ready made for this kind of interaction. Also with the interest of them it is smart to capitalize off of it knowing they will be the faces going forward. This is looking to be a very, very busy 2018 for Meghan and Harry. I also realized this is the 25th CHOGM, so it is also a milestone year. Very good point Ariel. With Brexit, it's a very significant year. On another note, I read the post about possible wedding dresses. There are some truly equisite dresses out there from really talented designers and I would love to see Meghan opt for a more traditional design rather a 'fashionable' one. I can't wait to see which designer has been selected! Forgive me for adding another comment but I just remembered something I forgot to include in my previous comment. The CHOGM is scheduled for April and I see that Camilla Tominey has included participation from the Duchess of Cambridge. Although nothing has been confirmed as yet, I was just wondering if Kate won't be on maternity leave by that time? Whether the baby is due before or after those dates, I'm sure Kate won't be present for the events scheduled... or would she? I agree with you completely. I think Kate will definitely be on maternity leave. Same. I am guessing that is one of the main reasons why Harry and Meghan might be more prominent because Kate will be preparing or recovering from birth. That is right around what many suspect is her due date. Yes I agree - that makes sense. Thank you Charlotte and Ariel, I did a double take when I saw DoC and April in that article... us royal watchers already have our calendars marked for April so it was a little surprising to see Kate's name being included. Wowser, I think MM and Harry attending this would be a powerful way of cementing their commitment to the Commonwealth, aswell as building on the experience Meghan has dealing with the UN. It seems an opportune moment as well to step in and help cover Catherine's absence potentially given her due date. I would agree about the Tiara moment though and say this wouldn't be appropriate - as Diana's first attendance before her marriage. I think by MM's presence alone at this State occasion sends a fabulous message of trust and support and so she doesn't need to wear a tiara to prove that. (maybe a small token loan bracelet would be a nice gesture!! to help her still have some serious bling on show). Mr.D, I agree.😊 A British Commonwealth Summit? Could anything be more apropos for Meghan? Don’t think so, lol. She has the skills, experience and passion for it. It really seems that Meghan is hitting the ground running as they said they would do. I'm glad the RF seems to be giving her a vote of confidence. However while I'm glad about this I also think that she needs to be given a grace period similar to Kate. While I know it will not be as long as Kate's grace period, I do hope the press will give her a break and refrain from the impulse to pre-write Meghan's narrative. Already Meghan is being "otherized" and used as a way to compare her has Hollywood vs. the innocent English Rose trope. Meghan will never be given a chance to learn and grow with this press that is already pre-judging her. The Press have undoubtably a new person to focus on, to praise and worship or to vilify depending on whatever mood they are in - as long as it sells magazines or clicks online. Of course the level of Social media/24/7 news and online scrutiny has intensified to an enormous level over the years...I'm constantly enraged by the amount of negative and disgusting comments made about her online by trolls, one would need a heart of steel to not listen to that sort of "noise". I guess that in a way, that's why it's been a struggle for Harry to settle down with someone who will take all of that on. I'm sure Meghan will in time, as Catherine and W &H have, learn to forget about the "noise". She seems keen and willing to listen and learn and eager to take up some new and exciting challenges. Harry seems to have her best interest at heart and from the beginning has been protective of here and so I'm quite confident he wont let her be "fast-tracked" into anything she wouldn't be comfortable or want not to do. "This isn't a game" as Harry said. But it's also a fine line of judging when and how utilise her strengths for good and not overwhelming her with so many things at once - I'm sure the mere fact shes away from family and friends and now living in the UK is a big adjustment in anyones books! She seems to me that she is confident in her abilities to cope with all this and has a eagerness to get stuck in. I would hope that after the wedding I'm sure that it will negate some natural down time away from the spotlight for her to adjust and have some "grace" period. Hopefully the next few years sees them settle in to a new house and home, potentially kids and start building their roles together. I think this is a long term /life time thing just as W&C have played it. My belief is that Meghan is totally zen about all of this. She knows how to read the temperature and make needed adjustments without altering her true self. I believe that she truly gets a lot out of simple human contact and making a connection with the REAL people and not the press. For myself I hate the BIASED and pre-judgemental coverage of her that has already began without any small grace period. No matter what the press tries to create lies and blame her no matter how positive the actual story is, it will be re-framed as Meghan trying to replace Kate who is on maternity leave. I don't know how long I can take the British FAKE NEWS. it is absolutely the worst in the world which is awful coming from an American. Hear hear, Mimi!!! I second you!! surfer girl makes an excellent point, though. Clickbait only works if we fall into the traps of pithy and gossipy headlines. I rarely visit the Daily Fail, even if it once was a guilty pleasure. Always consider your source. Give me Roya Nikkhah, Camilla Tominey, and Richard Palmer any day! And, that word helps remind us not to take the “bait”. I hope the Queen thinks to do that. The Queen always knows the best thing to do in these occassions!! Perhaps a brooch or pin in her hair.....?? It seems very unusual but then I am realizing that the Queen has been kind in ushering in new family members. Rather than breaking a "rule," it seems clear that MM can handle "it" whatever "it" is. Especially now, when she appears where there are fans of the RF. She handled her three visits perfectly---including unexpected aspects of the crowd. She is friendly and smart and eager---she does not need an adjustment period like other brides. I think that Kate has every desire to do good in her position but would prefer to just raise her family. There's nothing wrong with that. But MM has a drive and I'm glad it is being appreciated. Besides, she would charm the attendees! Imo Meghan does need adjustment period.Shes an American who was never part of the royal circle until a year ago and is entering into British society.Its going to be a completely different world to her,she has to know rules and etiquette that are different from what she's used to,she can't learn all these in 6 months.The sad thing is she's going to be vilified for every mistakes she makes and the press won't be as understanding as they have been for the other brides. I agree that she probably won't wear a tiara and that seems okay, IMO. I'd love to see some crazy blingy royal necklace on her though, and some jewels in her hair. Hi ILoveElephants, I have to respectfully disagree about H&M's children having the titles of Prince/Princess. Personally, I don't believe that Charles' reign will be very long and then with William as Monarch all the attention will be on him and his heir, George. Once William takes the throne, Harry will be in the same position as Edward and his family, brother and niece/nephew to the Monarch. And as George and Charlotte grow up more and more attention will be paid to them not to their older uncle and aunt. I believe that saddling H&M's children with the Prince/Princess title would be unfair and a burden in later years when they are expected to make their own way in the world. But this is just my opinion, I guess we won't know until that time comes. @ILoveElephant - that's correct. As it currently stands, only William's children are styled prince/princess. However, once Charles becomes king, Harry's children would automatically would be "upgraded" to prince/princess as the grandchildren of the monarch. I think the issue is that in the past (because people didn't live as long), there weren't so many generations of heirs who needed to have titles and styles sorted out so the queen is having to write letters patent to make necessary "fixes." This is all assuming that Harry and Meghan (and Charles, to some extent, I guess) want H&M's children to be styled as prince/princess of Sussex (or wherever). I really hope they are, especially since it seems clear that Harry and Meghan will be taking a prominent role in the family and in supporting the monarch now and in the future. They don't seem poised to lead a "private" life even though William now has (almost) 3 heirs. As far as I can remember, the couple has a say in it, too. Anne the Princess Royal, chose NOT to have her children styled as Prince/Princess at the time, she wanted to give them a chance of a "normal" upbringing out of the spotlight. Andrew´s children, though, were given the title "Princess". Edward apparently will one day "inherit" his father´s title, Duke of Edinburgh, but that´s apparently up to the then reigning monarch.. At the time of Edward´s marriage, the Queen informed the public that he would become an Earl and that his children would NOT be styled as "Prince/Princess", with the couple´s consent given (again, to give the children a chance of a more normal life). In addition to Mr. D's comment regarding a message of trust and support negating any need for a tiara to prove that, there is another point regarding Meghan's attendance at a State occasion that I'm sure has been given every consideration. A number of the Commonwealth nations are African nations. Meghan's dual heritage may very well be an asset in deepening ties between the Crown and Commonwealth (sooner rather than later) in a post-colonial era and rising republican sentiments in many of the Commonwealth's members. You make a valid point and I am sure one they have thought about a lot. Meghan is an asset in that way. A big one. Thanks Charlotte for the research. I have heard so much about what can and can not be done until a person marries into the Royal Family. Apparently, Ms Markle is not the only one where rules SEEM to have been laxed. Thanks again, Charlotte. Philly.😊 My sentiments exactly about Meghan’s unique potential contribution because of her dual ethnicity. I had texted that earlier but it has yet to post. Thanks for all you do Charlotte! This is also off topic but will you be doing a piece on what title might be bestowed on Prince Harry and Meghan on their wedding day? I’m very curious of your opinion. Thanks! I think it may be beneficial to not call MM/Harry's children prince or princess. Princess Anne's children have done very well without a title whereas Andrew's children seemed to have more trouble. Sounds like Charles is going to run the monarchy in a more streamlined way and additional princes and princesses are not needed. I think all the children have a right to become whatever they want, and titles can be a bit alienating. Based on MM's reception by that lovely lady who was Ugandan royalty, I think Philly makes a lot of sense! Who doesn't want to feel "included"? Why would it not be beneficial? What trouble do Andrew's children have? I hope Meghan and Harry have lots of princes and princesses. It's the RF's decision anyway. Allision, I don't think the way that Princess Anne's children turned out, compared to Prince Andrew's children has anything to do with a title or no title. Every individual has the potential to do great things, or have a train wreck of a life. For the most part all the Queen's grandchildren are doing just fine. Harry and Meghan's children will automatically get HRH once Charles takes the throne unless HM issues new letters before she dies or if Harry and Meghan don't want them to have it. I assume they will be born Lord/Lady and then let it naturally happen. They are indeed all doing well, but perhaps not having a title makes one more aware of needing to have a real job, etc. And perhaps it makes one feel more free to pursue any goal. Holy moly. I'm still getting my thoughts together about this...but it seems huge! Not only that she would go as a fiancee, but also as the bride (to be) of the 5th in line. Did other spouses attend such high profile events? Sarah or Sophie or Anne's husbands? And, not even that it's just a high profile event, like a state dinner (which, yes those further down the succession line attend), but it's a somewhat political event. This seems fascinating to me. Has Kate ever attended?? I searched but didn't find any photos of her at any past CHOGM events. Harry and Meghan are going to be a royal power couple. As Rihanna sang, Meghan came to work, work, work, work, work, work! I'm loving this. I cannot wait to see what charities Meghan chooses. ITK.😊 Eve shared info on the formal events that Diana attended as a fiancé to Charles. Charlotte included that info and photos of (a tiara-less) Diana from both of those events in her narrative above. I'm hopeful to see Meghan accompany Harry to the State Dinner associated with the Commonwealth Heads of Government Meeting. What a wonderful introduction to the Commonwealth family of nations! I've been perusing HM's vault, and have some suggestions for what the Queen might loan Meghan for the event. I'd prefer to wait until the wedding day for Meghan to sport a tiara, but I'd love to see her in some beautiful jewels at the Dinner. This might warrant a separate post, Charlotte?! Some excellent choices here Ms. Cuppa - that Opal necklace is a whopper!! Ms.Cuppa.😊 With the Provonia “Raigal” gown that I’ve chosen for Meghan via anon 02:30’s suggested gown, no necklace is needed for that. It seems from Meghan’s engagement interview, that opals were made for her. The ones she wore then were perfect for the occasion and her green dress. I personally love both statement pieces and delicate more subtle pieces. And I think the opal necklace is beautiful. I think it looked beautiful on the Queen. I don’t know why she only wore it once. Meghan could look beautiful wearing the opal also but I don’t think big statement pieces are her thing. I do hope someone starts wearing it though and wearing it with the perfect complimentary outfits. Holy COW that opal! And that it was a gift from the Aussies, would make sense to break it out at the CHOGM. That diamond and gold cuff is certainly, ahem, difficult to wear. But would love to see someone that's rather tall and willowy, like Kate or Meghan, take a stab at it. I can see it looking fab with a strapless or portrait neckline. The Emerald Tassel Parure is beautiful,but I don't like the Andamooka Opal Necklace. I hope Meghan will be a gorgeous Royal Lady,I guess she will choose simple and minimal jewels. Really excited to follow along ! I hope she does speak at her own wedding and I hope she takes on more and more responsibility. I think that she is used to working a job - sitting at home might feel alien to her. It could be a can of worms. If she does speak, me thinks short and sweet is the way to go. I agree, rf.😊 It’s a wedding, not a stage and, it is not a platform. :) Sweet, gracious and short will be better. She’ll do fine. (Hopefully). I just published all awaiting comments. Are yours here now? Surfer Girl, forgive me--I was unaware of your gown selection, but absolutely love it! I agree, no jewels needed, but it would be stunning with a tiara! I LOVE the bling! And hope Meghan takes advantage of the jewels. It will be fun to see how she interprets them--she's definitely not a 'matchy, matchy' type, so I would never expect her to wear a 'set' of earrings and necklace. I hope Meghan values Royal “bling history” and utilizes all the beauty and provenance of it. And in her own way. Adding even more provenance to the pieces. I am astonished that the bunch of Royal gals, Sophie, Zara, Autumn, Eugenie, Beatrice and Kate haven’t been playing in “Granny’s” jewelry box and the Royal jewelry vaults. Gorgeous dress and right in the Meghan (tip of the hat to CBK) wheelhouse. LOVE it. It is in that wheelhouse, upstate😊. I so hope she somehow saw that dress before designing hers. Where will Meghan stay the night before the wedding? Harry is continuing to succeed in keeping media at bay except for official stuff. Meghan disappeared from the media except for PR stuff while still in Canada (no photos to and from yoga, grocery shopping, etc.) and however Harry is managing that it is still working. I am curious, how does he do it? Considering Kate will be due or just had the baby by that time it’s most likely true. As much as I would like Meghan to get some time to adjust it just isn’t going to happen. Being in the BRF isn’t just a family it’s a job. She’s not going to get a break from the press who try their hardest to create division between the Fab Four. I doubt the tiara thing as well besides I would be bummed to see her with one before the wedding because for me that’s adds to the excitement of the wedding day. To find out what title, tiara and dress she will have on the wedding day is the best part. To answer a question if Harry wants his kids to be Prince and Princess before his dad is on the throne, granny will make it happen. I am certain that Harry and Meghan's children will be Prince and Princess. Elizabeth had four children, when they all married and had children there were enough to make different decisions. Charles only has two children. Without a doubt his grandchildren will bear those titles. Meghan’s has worn Erdem before and hers looked cute on her. (The only erdem I have yet thought passable.) But I hope to never see another Erdem on any Royal ever, including on Meghan tonight.